Thank you Terrence Mallick for this beautiful gift! I absolutely loved the impressionistic close-up, amplified aesthetic of “The Tree of Life,” winner of the the Palme d’Or at the Cannes Film Festival. This film is succinctly evocative of 1950s Christian American suburbia. But more than just a meditative look at society, Malick literally illuminates the space of this film with light and emotion. He gives the audience a shoulder-perched view and earshot of not only the O’Brien family, but of every level of life from microscopic views and sounds of biology, which always remind me of the late Madeleine L’Engel and her obsession with mitochondria, to macroscopic images of the phenomenal universe, and the quiet of space (aside from the crushing, bubbling, crashing of meteors and planetary magma). At every level, Malick gives the subject in the frame a hearty close focus, nearly fish-eye view, like having a camera strapped to a dog’s head. 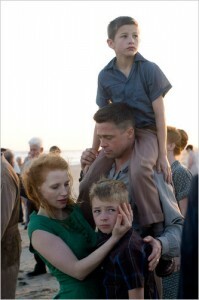 A surprisingly artistic and ambient film for an all-star cast including Brad Pitt, Sean Penn, and the silver screen naive, Jessica Chastain. With an ambition, it seems, to give today’s young techie generation a glimpse of what many consider to be America’s innocent golden era—post-war, at the dawn of the space age—Malick illustrates the fall of that innocence, creating a harsh contrast with an uber modern present day adult perspective, looking out the top of gleaming skyscraper windows in a pressed suit, to the natural setting of fields and forests and gardens of still rural suburban South childhood. However dystopian that ideal nuclear family may seem psychologically, there are pieces of the way of life, sans TV and consumerism, that seem inspirational from a Gen Y perspective. From the classic image of boys banging sticks and ravaging the outdoors, to the taste of drinking from a garden hose, it reminds Millennials about the need to get your kids out of the house; let them get dirty and play in the mud; consider the meaning of life; garden; read; love; live with grace. The nuns taught us there were two ways through life – the way of nature and the way of grace. You have to choose which one you’ll follow. The nuns taught us that no one who loves the way of grace ever comes to a bad end. The film’s epic fabric stretches our perspective and forces us to awe at the size of the universe and wonder the purpose of our place within it. The irritable force of balance from nurturing to destruction is constantly fating our doom, but Malick seems to believe that the promise of light and the afterlife ultimately await our return. This entry was posted in Blog and tagged Brad Pitt, Cannes Film Festival winner, film reviews, Jessica Chastain, Linkedin, Palme d'Or, Sean Penn, Terrence Mallick, The Tree of Life Review. Bookmark the permalink.